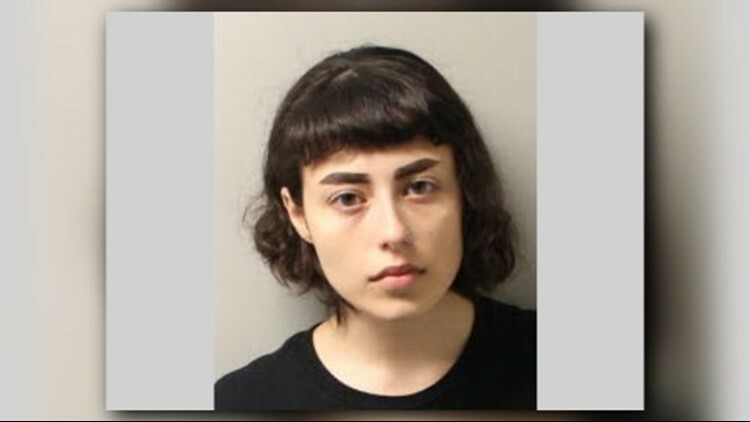 An FSU student was arrested after she was caught on camera throwing chocolate milk on a Republican volunteer she accused of supporting Nazis. A 19-year-old woman was arrested Thursday for throwing chocolate milk on a Republican volunteer at Florida State's Landis Green. In a video posted to Facebook and Twitter recording the altercation that received 49,000 views, Shelby Shoup is seen yelling at the volunteers saying they're supporting Nazis and throwing chocolate milk on them Tuesday. WARNING: This video contains language that some may find offensive. "I hope y'all realize that you are normalizing and enabling Nazis," said Shoup, who was charged with battery, according to the Leon County Sheriff's Office. "Eleven of my people are f----- dead this weekend," she continued, referring to the Pittsburgh synagogue shooting. As she left, Shoup kicked a Ron DeSantis for Governor sign out of the grass saying "F--- Ron DeSantis." The volunteer Shoup threw the milk at was identified as FSU College of Republicans Vice-Membership Chair Daisy Judge. A statement from the group called the altercation an "alarming display of the extremely politically charged environment that has arisen in recent months and years." Shoup says on her LinkedIn she's an intern for Andrew Gillum's gubernatorial campaign. Spokesman Geoff Burgan said Friday he "can't comment" on whether she is an official volunteer or intern for Gillum's campaign. The woman was a speaker at a June Families Belong Together rally at Wakulla County Sheriff's Office's ICE detention facility in Crawfordville protesting President Donald Trump's calling for criminal prosecution and separation for those crossing the border illegally. "We need to tear the whole system down," said Shoup, one of the organizers. "Abolishing ICE is our minimum demand." The video of the Landis Green incident was posted by the brother of Meadow Pollack, who was killed in the Parkland high school shooting. Read more from our news partner.